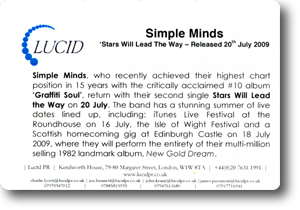 Simple Minds, who recently achieved their highest chart position in 15 years with the critically acclaimed #10 album Graffiti Soul, return with their second single Stars Will Lead The Way on 20 July through Universal Music Record Label (UMRL). It was also confirmed this week that Simple Minds will perform at this year's iTunes Live Festival at the Roundhouse on 16 July. Simple Minds flawless return has seen them add a contemporary twist to their iconic sound, which is self evident in their new release. Stars Will Lead The Way erupts with their distinctive synth-beats and guitar riffs, as Jim Kerr's melodious tones soar through an immensely catchy tune. 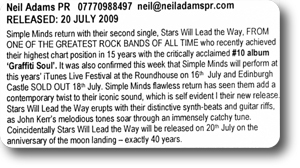 Coincidentally Stars Will Lead The Way will be relesed on 20 July on the anniversary of the moon landing - exactly 40 years. It is clear that astronomy is a passion for the band as they have taken one giant leap rather than one small step in keeping the theme concurrent through the album, and touched on with their first single Rockets. Having achieved phenomenal worldwide success during their 30-year career, Simple Minds is one of the few band with both the musicianship and the staying power to survive the ever-changing music scene and still be selling out stadiums galore. A reminder that Simple Minds are one of the greatest live performers, the band has a stunning summer of live dates lined up, including: iTunes Live Festival at the Roadhouse on 16 July, the Isle of Wight Festival and a Scottish homecoming gig at Edinburgh Castle on 18 July 2009, where they will perform the entirety of their multi-million selling 1982 landmark album, New Gold Dream. 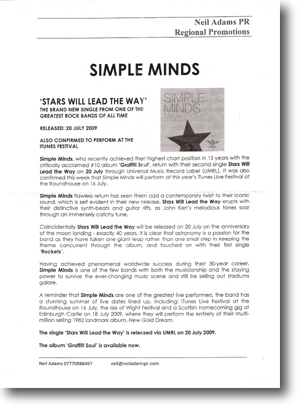 The single 'Stars Will Lead The Way' is released via UMRL on 20 July 2009. Hailed by millions as the best "live" rock'n'roll bands in the world, Simple Minds are pleased to announce the UK leg of their forthcoming Graffiti Soul World Tour. The UK concerts will take in seven dates, and will dovetail the highly anticipated release of Simple Minds' 15th studio album Graffiti Soul released on May 25th. The tour follows hot on the heels of last year's triumphant sold out 30th Anniversary Tour which saw the band performing the entirety of their milestone 1982 album New Gold Dream. Simple Minds will perform songs from the new Graffiti Soul album including the single Rockets including Stars Will Lead The Way, Moscow Underground, Light Travels and This Is It. Simple Minds will also perform classic hits from their vast catalogue including the albums Life In A Day (1979), Real To Real Cacophony (1979), Empires And Dance (1980), Sons And Fascination (1981), Sparkle In The Rain (1984), Once Upon A Time (1985), Street Fighting Years (1989) and beyond. Classic songs include I Travel, Love Song, Promised You A Miracle, Sanctify Yourself, Glittering Prize, Alive And Kicking, Waterfront, Don't You (Forget About Me), Up On The Catwalk, Speed Your Love To Me and many more. Over the years Simple Minds have notched up twenty Top 20 hits in a career spanning nearly three decades. The band have sold over 35 million records, had five number one albums, a No. 1 single in America - plus three American top ten singles and were voted Q Magazine's World's Best Live Act . Simple Minds who recently achieved their highest chart position in 15 years with the critically acclaimed #10 album Graffiti Soul, return with their second single Stars Will Lead The Way on 20 July. The band has a stunning summer of live dates lined up, including: iTunes Live Festival at the Roundhouse on 16 July, the Isle of Wight Festival and a Scottish homecoming gig at Edinburgh Castle on 18 July 2009, where they will perform the entirety of their multi-million selling 1982 landmark album, New Gold Dream. Simple Minds return with their second single, Stars Will Lead The Way, FROM ONE OF THE GREATEST ROCK BANDS OF ALL TIME who recently achieved their highest chart position in 15 years with the critically acclaimed #10 album Graffiti Soul. It was also confirmed this week that Simple Minds will perform at this years iTunes Live Festival at The Roundhouse on 16th July and Edinburgh Castle SOLD OUT 18th July. Simple Minds flawless return has seen them add a contemporary twist to their iconic sound, which is self evident on their new release. Stars Will Lead The Way erupts with their distinctive synth-beats and guitar riffs, as Jim Kerr's melodious tones soar through an immensely catchy tune. Incidentally Stars Will Lead The Way will be released on 20th July on the anniversary of the moon landing - exactly 40 years.